“Friedland came out his helicopter. He had a red jumper and running shoes on. He kissed the land and run straight to the Oyu Tolgoi discovery site.” A local elder told me this story. The date is not clear but he surely referred to the early 2000s when there was exploding excitement around the discovery of the Oyu Tolgoi deposit. The discovery was hailed by some people in Mongolia as the most important economic opportunity for the country’s future prosperity. While being criticized by many, Robert Friedland, the then CEO of Ivanhoe Mines, was described by some people as a saviour whose audacious decisions led to the discovery of Oyu Tolgoi. The discovery, however, did not emerge overnight. Several books have been written in Mongolia about different aspects of the Oyu Tolgoi project. Some of them contain interesting memoirs of the members of the Oyu Tolgoi exploration project. In particular, the memoirs of D.Garamjav and S.Sanjdorj, two senior Mongolian geoscientists who were instrumental in the discovery, are valuable information sources. In the following, a story of Oyu Tolgoi’s discovery is outlined based on the reading of these and other sources (see, References). Russian explorers and geologists made the first geological observations in Mongolia during the late 19th century. After the 1917 Russian Communist revolution, the Soviet state paid significant attention to geology as an applied science to serve its industrial and military interests. Soviet geologists created the first general regional geological maps in Mongolia in the 1940s. One of these regional studies reported that the Oyu Tolgoi (Turquoise Hill) area had a potential for copper deposits in 1957. The author of the report noted that advanced mineral exploration was suggested by local people who all knew about mineral occurrences in the area. 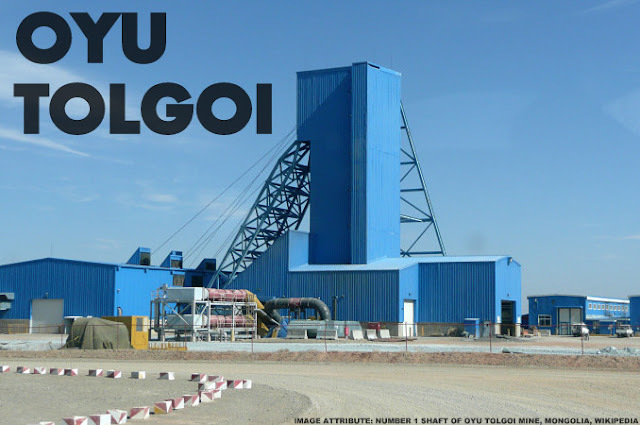 What is now called Oyu Tolgoi was reported as the Bor Ovoo (Brown Hill) area in the report. This name was used in the geological maps created at the time. Although the report recommended further study, Bor Ovoo was not revisited until the early 1980s. An interesting take on from the report is that local knowledge was important for helping focus geological study, especially in the initial geological prospecting and mapping projects in Mongolia. There are many hills and mountain names with prefixes such as ‘precious’ and ‘rich’ in Mongolia, indicating local histories and knowledge of mineral occurrences and their use. In the Oyu Tolgoi mine area, for example, small circular pits and minor copper smelting slag from the Bronze Age were discovered during the extensive mineral exploration stage. Another example is Erdenet, which was the largest mine in Mongolia until the discovery of Oyu Tolgoi. The Erdenet Ovoo (Precious Hill) copper-molybdenum deposit was discovered by Czech geologists in the early 1960s. As suggested by their Mongolian colleagues, they made a short visit to the area on their way to another exploration area. The samples they collected showed high values of copper and other minerals, which led in a short period of time to a joint Mongolia-Czech exploration project at Erdenet Ovoo. It is worth noting that the subsequent development of the Erdenet project coincided with a positive commodities cycle. The exploration project was interrupted by the Prague Spring of 1968. The results by then, however had attracted interest from Moscow, with the Soviet Union at the time a far smaller copper producer than leading producers such as the USA and Chile. The significant commodities boom that occurred in the early 1970s was apparently key to the Soviet Union’s decision to invest in Erdenet and establish a joint venture with Mongolia. Mongolian geologists carried out a preliminary geological and geochemical mapping study in the Oyu Tolgoi area in the 1980s. In his memoir, geologist D.Garamjav, who led the team that discovered the high-grade gold, copper and molybdenum surface zone at Oyu Tolgoi in 2001, noted that he had observed evidence of alteration and copper staining in the area when he did fieldwork in 1983. The area was subsequently covered by extensive geological mapping in the Mongolian Gobi region in the late 1980s, a period when geology was consolidated firmly as an applied science in Mongolia. Exploration and estimation of the nation’s vast mineral reserves and economic deposits, were high priority for the state. Erdenet had become the major source of national export income by the mid-1980s as Mongolia like other Soviet bloc countries began to experience significant economic downturns. Mongolia underwent severe economic recession after its transition to a market-based economy and multiparty democracy in 1990. The national income shrunk substantially as the aid Mongolia had received from the Soviet Union and other socialist countries, that constituted one-third of GDP, was abruptly discontinued. All sectors of the economy were affected by the crisis, including geological surveying and the mining industry. Hundreds of geologists became unemployed as the government curtailed funding for geological fieldwork. Mongolian political leaders tried different ways to attract foreign aid and business interest. In 1994, the then CEO of the state-owned Erdenet Mining Corporation (EMC) Sh.Otgonbileg contacted the US-based Magma Copper Company (MCC), which was at the time one of the largest producers of copper in the world. After declining EMC’s two separate proposals on investment in the Erdenet Mine and a joint copper production complex, MCC proposed to run a joint copper-targeted mineral exploration project in Mongolia. As a result, the joint venture company Erdenet-Magma was established in 1995 under a contract between EMC and MCC. S.Diyakov, a Ukrainian-born, multi-lingual (including Russian) geologist from MCC, was appointed as the project lead. The company recruited several Mongolian senior geologists experienced in copper mineralisation, including D.Garamjav. By 1997, more than 80% of Mongolia has been mapped at a scale of 1:200,000 and 15% at a scale of 1:50,000. Geological mapping, geochemical sampling and airborne geophysical surveys over portions of the country had generated a good database since the 1960s. Most of the geological information was in Mongolian or Russian language. The Erdenet-Magma team reviewed all existing reports on copper mineralisation in Mongolia and selected over 20 areas to carry out geological field study. Two geological teams were established to explore selected areas in Western and Central Mongolia in 1995. The teams visited 73 of the deemed most promising mineral occurrences in Mongolia and selected the best four for more detailed evaluation and exploration. These were in Zavkhan, Bayankhongor and Umnugovi aimags. The Central Mongolian team visited several areas in the Gobi region and although D.Garamjav, mentioned earlier, suggested visiting the Oyu Tolgoi area, the team decided to visit another area instead. As one of the first exploration projects involving Mongolian and Western geologists and Soviet and Western methods, the fieldwork was a learning and intercultural process. Besides technical exchange, cultural understanding and learning occurred. D.Garamjav tells an interesting story in his memoir. The exploration crew stopped for an overnight camp near a herder household somewhere in the Gobi and began to erect their tents. The leader of the crew, a geologist from the U.S.A, complained about the odour of a nearby animal shelter and dung and asked to find a better place. The translation was made literally. This angered the Mongolian crew members, especially senior geologists. A strange division occurred, whereby the Mongolian and foreign members erected their tents at a distance to each other. The incident ended well with mutual understanding when the crew leader called a meeting in the evening and apologized for his behaviour. In 1996, MCC was acquired by BHP (now BHP Billiton). Under new ownership, the exploration team at the insistence of D. Garamjav visited the Oyu Tolgoi area for the first time in September 1996. The company’s regional reconnaissance program in Dornod and Sukhbaatar aimags had not found any significant copper targets, and only two days were enough for the team to decide that Oyu Tolgoi was a promising copper deposit and apply for an exploration concession. In 1997, Magma-Erdenet was dissolved because EMC’s failed to the contract terms in co-funding the joint venture, and the CEO of ECC was involved in series of political and corruption scandals at the time. BHP Billiton decided to establish a branch office in Ulaanbaatar in 1997. A new liberal Mineral Law adopted by the Mongolian parliament served as an important incentive for the company to launch an expensive exploration program of its own. BHP began detailed exploration at Oyu Tolgoi as part of a regional reconnaissance program of the South Gobi region during the 1997 field season. In 1997-1998, the BHP Billiton team at Oyu Tolgoi completed 23 diamond drill holes. Although the first phase showed encouraging results, the second and third phases of drilling failed to identify significant ore grade mineralization. In 1999, the new CEO of BHP, Paul Anderson, commenced company-wide restructuring, cutting exploration budgets and jobs. The company decided to close the Mongolia office, and its exploration tenements, including the Oyu Tolgoi exploration concession, were offered for joint venture. A presentation of the Oyu Tolgoi deposit was given at the PDAC meeting in Toronto in March 1999. Ivanhoe Mines, a Vancouver-based exploration company that had launched exploration programs in Mongolia after the introduction of the 1997 Minerals Law, signed an option agreement with BHP Billiton to earn a 100% interest in the Oyu Tolgoi Concession in May 2000. The company completed 109 drill holes by September 2000, with encouraging results. Ivanhoe subsequently opened a major office in Ulaanbaatar under the name of Ivanhoe Mines Mongolia Inc (IMMI). However, 149 drill holes were completed before the project’s ‘eureka’ discovery hole, OTD-150, was drilled in in Southwest zone of the Oyu Tolgoi area in July 2001. D.Garamjav was central to deciding the location of the hole. According to the Mongolian project members, the project was running out of funding. D.Garamjav was invited to choose the location of OTD-150, one of three deep drill holes that the project could afford. The discovery drill had a depth of 590 metres, and it penetrated a new zone of porphyry mineralisation containing high-grade gold, copper and molybdenum. As a result, more drill rigs were added to speed up evaluation of the Oyu Tolgoi deposit. The results demonstrate the benefits of using local expertise and knowledge in conjunction with international good practice. In August, another discovery hole, OTD-159, was completed in the Southwest zone, confirming the massive economic potential of the deposit. IMMI launched an extensive drilling program to expand the resources. Consequently, Ivanhoe Mines drilled a hole (OTD-270) in the far northern portion of the Oyu Tolgoi area, which resulted in the discovery of another massive deposit at depth (subsequently named after Hugo Dummett, Vice President of exploration at BHP Billiton and Ivanhoe Mines), one of the world’s largest and highest-grade gold/copper deposits. By mid-2003, Oyu Tolgoi had become one of the biggest mining exploration projects in the world, with 18 exploration drill rigs operating. While a number of Mongolian drilling companies were hired during the early stages of exploration at Oyu Tolgoi, international companies with more advanced technical and human expertise began to lead the advanced exploration drilling. Like Erdenet, further development of the Oyu Tolgoi project coincided with a commodities boom that began in 2002. The discovery of the Oyu Tolgoi deposit and the Erdenet deposit shows how development momentum can result from the dynamic interface of global and local factors, and especially the influence of international or transnational political and economic events in a small, landlocked state. Mining legislation that provides certainty on the tenement rights and protection for explorers is vital to encourage mineral discoveries. BHP Billiton’s extensive exploration project and Ivanhoe’s takeover were encouraged by the 1997 Minerals Law that was praised as the most investment-friendly minerals law in the world at the time. The discovery history of Oyu Tolgoi is a vivid example of the volatile nature of mineral exploration. It shows how a range of factors such as geological endowment, local knowledge, market trends, commodity price and legal environment can shape the progress and results of exploration projects. Tapping into local expertise and knowledge is crucial for international developers. Strategic, patient and respectful relationships between local and international expertise and experience can yield positive outcomes. Dr. Byambajav Dalaibuyan joined Center for Social Responsibility in Mining (CSRM) as a Postdoctoral Research Fellow in April 2013. He has a wide range of research and education experiences in different cultural and institutional environments. He received his PhD degree in sociology from Hokkaido University, Japan in 2012. He worked as a lecturer of Political Science at the Mongolian State University of Education from 2000 to 2006 and has been involved in many research and capacity building projects in Mongolia. In 2011, he spent ten months as a visiting PhD scholar at the Institute of Asian Research at the University of British Columbia, Canada. Kirwin, Douglas. 2006. "The giant Oyu Tolgoi porphyry copper deposit: discovery history and implications for future exploration in the Gobi". Paper presented at the SE Europe Geoscience Foundation Conference. Sofia, Bulgaria . Robertson, Rob. 2001. “Ivanhoe sparks excitement with Mongolian copper-gold find“. Northern Miner. Yuki, Konogaya. 2013. Interview with Choijin Khurts, the former Minister of Geology and Mining. This work was originally published at Mongolia Focus, UBC Canada under is licensed under a Creative CommonsAttribution-NonCommercial-ShareAlike 2.5 Canada.